Poor (Modern Arabic Literature) "Hard Cover"
"This is your last day. Be strong. Don't hesitate. Cut and run. An exit with no return." 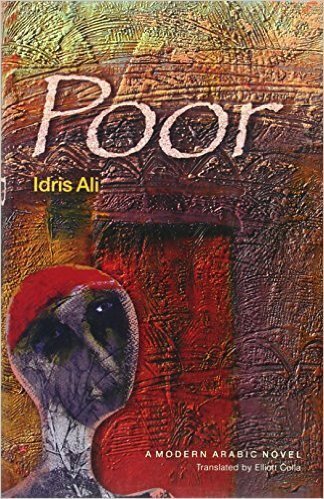 Idris Alis confessional novel opens with these words, spoken on an unbearably hot August afternoon in downtown Cairo, where the Nubian narrator has just decided, once and for all, to end his life. Delirious and thirsty, he wanders around venting his resentments large and small, his sexual frustrations, and his sense of powerlessness in the face of unremitting injustice. He seeks to expunge his failed life in the Nile: the river that had been the life blood of his country for millennia, and that with Egypt's new dam now drowns Nubia, flinging her dispossessed sons north and south into exile. Many years ago, the narrator was one of those sons, fleeing flood and famine only to arrive in Cairo, penniless and shoeless, in time to see it go up in flames, the old regime overthrown by "the men in tanks." Poor is the story of a life of hardship, adversity, and emotional starvation. It is also the story of opportunities squandered and hopes traded away for nothing of a life lived, at times, all too poorly.